For the QIF file name select Browse to your desktop and load in Converted.QIF. 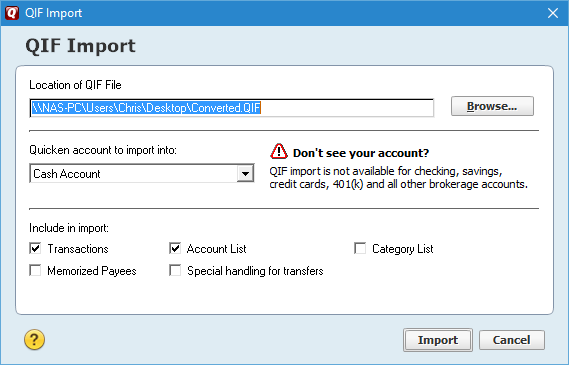 Select a Cash Account from the "Quicken account to import into:" pull down menu. If you don't see any accounts you will have to create a cash account just so it has an account name. It doesn't matter the account name you select, the account name in the QIF file will override this. You will be told which account that the import is going into, and how many transactions were imported. It will also tell you that it is going to create categories and such. You should now be able to go to your account register(s) and accept the new transactions.